This clever, poster-size bubble calendar lets you pop your way through an entire year. Very few things in life are as satisfying as popping Bubble Wrap™. So why shouldn't you partake it in it more often? How about every day? 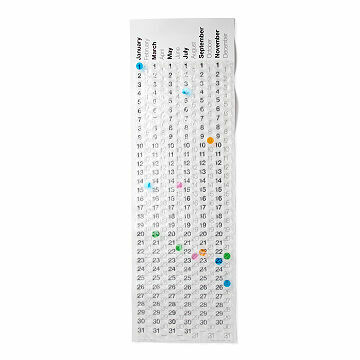 Very clever and very fun, this poster-size Bubble Wrap™ Calendar allows you to do just that. Each day of the year has a bubble to pop. All days of the week and U.S. holidays are marked for quick reference. Made in Brooklyn, New York. Everyone in the office fights over who gets to pop the days bubble! Clever Calendar Creates Family Fun! Very fun for young kids and their grown-ups! I do wish it had a stick and string at the top to hang it up - like a scroll. It is big so hanging it up took some doing. Ideally adding that would make it easy to hang on a hook. Even without this feature, we are loving it! This young man will enjoy popping the bubble each morning in order to stay current and up to date. To keep track of important dates popping each day as it passes. It will hang on my daughter's wall, and she will enjoy it the whole year!